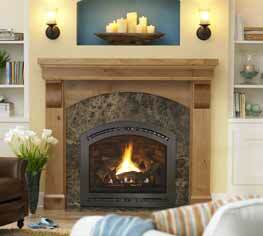 Cerona takes serious heat output and stylishly wraps it in a classic arched fireplace. Plus it's incredibly efficient - the best of any Heat & Glo fireplace. High Style, high heat and high efficiency. Cerona is a whole hearth system, with a great selection of mantels, surrounds, fronts and finished to suit any interior style. Our patented FireBrick® material creates a true arched firebox, crafted with cantilevered corners to look just like a masonry hearth. Don't need all the heat? Cerona is easily adjustable, and can be turned down by 30%. Optional heat management kits - Heat Zone® and Heat Duct - put all the heat to use, redirecting any excess warm air to other areas of the home.